[Josh] and his lab partner [Eric] needed a final project for their Embedded Systems Design class, and thought that designing an Arduino shield would be a cool idea. They noticed that there are plenty of ways to get an Arduino to keep time, though none that they knew of utilized WWVB (Atomic Time) signals directly. 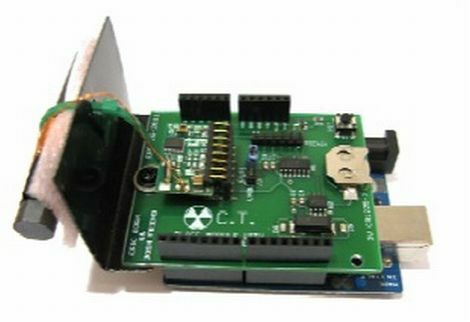 The Chrono-tomic Arduino shield uses a C-MAX radio to demodulate the WWVB signal, demodulating it and passing it along to a PIC16F1824 microcontroller. The PIC decodes the data frame and verifies it is valid, sending the time to an MCP79410N real-time clock module. We can hear the “Yo dawg I herd you like microcontrollers so I put a microcontroller on your microcontroller shield” jokes already, but the pair says that they offloaded the time processing to the PIC in order to let the Arduino focus on whatever tasks it has been delegated. The Arduino code merely needs to request the time from the RTC whenever it is required, rather than deal with the decoding itself. Is it overkill? Perhaps – though we think it heavily depends on your application and configuration. We can certainly conjure up situations where it would be useful. Make some artsy – craftsy clock dial type thingies for the servos, and you’re in business. Instaclock. Note that you can buy 60 second sand clock/egg timer elements for quite the reasonable price… Then you turn them into what amounts to 7 segment display sand timer clock. Mechanically complicated, yet cool. offloading the time keeping task to a separate UC is good enough, but why mix disciplines of PIC and AVR. using a second Atmel chip? More advanced Arduino users could tweak the processor on the shield without having to invest in Microchip gear. I agree. While I won’t debate which is better, usually people are tooled for one or the other. We had thought of just using another AVR for this project, but went with a PIC to learn something new. Also, I happen to be “tooled up” for the PIC series owing to the fact that my dad is an FAE for Microchip. Tweaking the PIC seems like a theoretical requirement only. What other useful functions can it serve other than returning an accurate time? 2) Require you to have enough knowledge about the radio and RTC that you could interface them directly to the Arduino anyway? So where do people pick up (small quantities) of these CMMR-* receiver boards? Everyone seems not to have them in stock. Ah, digikey used to carry them until very recently. Part number 561-1014-ND. CMAX part # CMMR-6P-60. I’m hoping this is temporary, as this is a swell little device. I got the modules from SparkFun (http://www.sparkfun.com/products/10060), but had to sign up for an email notification to tell me when they were back in stock. We got lucky because I had ordered a bunch previously for another project. SparkFun seems to have less than 40 in stock at a time when they have them and they go quick. Yo dog, I heard you like projects. So we put a project on top of your project, so you can work while youre working! Earlier today I thought about stacking a arduino pro board, on another arduino, you could just have certion pins connected to the bottom board. Why an RTC? Seems to me the pic could do that too while it’s sitting there being overkill. I was wondering the same thing and also how reliable those wwvb signals were. Are there any manufacturers aside from c-max who make a front-end for the wwvb and other clock signals too? The PIC probably could handle timekeeping, but the RTC adds easy battery backup and is probably more accurate than using a µC as an RTC. Some PICs like the 16F88 have a timer with its own xtal driver for applications like this. Just use the internal oscillator for running the core, and throw on a 32KHz crystal scavenged from any of a million places, and the code pretty much writes itself. For one of my projects I bought a cheap radio controlled clock from Clas Ohlson and dismantled it to find that the DCF77 receiver was on its own board – all it needed was a 3V power supply and it generated a nice clean digital logic signal that was a doddle to decode using a pin change interrupt on an AVR. The biggest problem was shielding it from interference generated by the AVR! Thats actually a really great idea. Probably the best option if you are just building this for your own personal projects. The requirements for this project prevented us from doing this since we had to have a bill of materials with the suppliers detailed on it. I see that this is university project. Could you offload it somewhere where it could survive your graduation? All info there is very interesting. Like I told – 403. Did you have change to upload it to somewhere else? I did upload the site somewhere else but forgot to post about it here..
God I am so lazy. I needed accurate time so I simply punted and grabbed the time from a GPS. At least it only takes up one pin. 1 wire RTC not good enough for ya :) ? I’m currently doing a long-term experiment that requires accurate timekeeping. The problem with common solutions is that they are based on a crystal oscillator, and the frequency drifts for various reasons (temperature and age). The amateur-accessible versions of GPS (and presumably WWV) drift because the signals have to travel through the atmosphere, where the speed of light changes with differences in moisture content. The GPS signal is retrieved using a serial port running at 9600 baud, so the resolution isn’t great. You can’t timestamp an event with more than about a half-second resolution. Also, GPS and WWV receivers don’t work well indoors. My best solution so far is to use an OXCO chip, available on eBay for $20. These have very low drift, on the scale of 12 PPB. That’s 12 seconds of drift every 30 years. If the system can access the internet, then you can synchronize with a system that uses NTP for a resolution of a few tens of milliseconds. With an OXCO chip, occasionally synchronizing to NTP gives you a very accurate timestamp. Okian, that’s why you need a GPS with a PPS signal. The PPS (PulsePerSecond) signals the start of every second while the serial data from the GPS get you the time and location. The variance in atmosphere is accounted for by the GPS as it locks to 3 to 12 satellites. My stratum 1 NTP servers drift +/- 5 microseconds. If the connection to the GPS satellites are lost then it’s good to have the OXCO though. A GPS without a PPS signal is no good as an accurate time source. Some funny perspectives around here. IMO, the extra MCU goes further to making this device easy to use than Arduino headers, for less money. Nice project. You don’t happen to have a couple of extra boards around you might want to part with, maybe with the parts? I have a CMMR-6P-60 and CMMR-6P-100 and was just getting ready to “try” and design this same thing for a couple of data loggers. Thanks for sharing and hope you got the A.